There is so much to do in and around Nags Head, NC! Nags Head is renowned for water sports such as surfing and kiteboarding. Visitors who are new to these water sports can easily take a lesson and rent equipment. Outer Banks fishing is another extremely popular pastime, whether from the shore, a pier or a charter boat. For those who prefer activities of the shopping variety, Nags Head offers Tanger Outlets and numerous fun boutiques. Be sure to check out Gallery Row, located around Mile Post 10 in Nags Head. Take time to browse through seven galleries for art, jewelry, souvenirs, crafts, pottery, candles and more. A vacation to Nags Head, NC isn't complete without visiting these local attractions. Bodie Island Light Station - Located on the Cape Hatteras National Seashore, the lighthouse grounds are open year round. Explore the bookstore and exhibits in the Keepers Quarters. Take time to explore the beautiful shores of Coquina Beach, which is located directly across Highway 12 from the lighthouse. Jockey's Ridge State Park - Visit the highest sand dune on the East Coast! 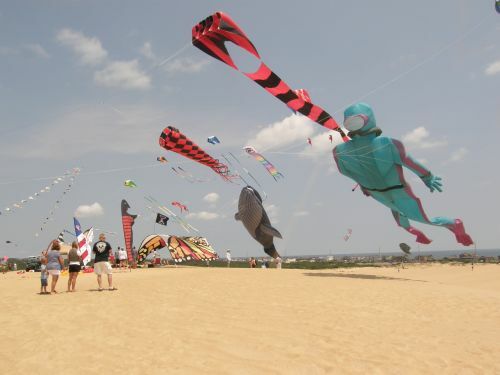 Jockey's Ridge is the place where hang gliding enthusiasts from across the country come to practice their sport. Bring a kite or just climb to the top for the gorgeous view! The Unpainted Aristocracy This is the nickname given to the row of historic cottages along the Nags Head oceanfront. Some of these homes date back as far as the mid-1800s. Originally constructed by wealthy mainland plantation owners, they are piece of Outer Banks history. Most were built in the "Old Nags Head Style" with wrap-around porches, cedar shingles and propped shutters. Driving by these historic homes provides a glimpse of what Nags Head was like long ago. Wreck of the USS Huron - About 150 yards north of the Nags Head Pier is a public beach access with a pavilion that explains the history of the Huron and a description of the dive site. Family Friendly Events - Every year Nags Head hosts some of the best family friendly events on the Outer Banks. From the Annual Rogallo Kite Festival to the Watermelon Festival, there's something for everyone at all times of the year. Check our Outer Banks Beach Buzz Blog or FaceBook fan page for more information on local upcoming events.